NOTE: The following paragraphs rely heavily upon this page of the "fabi.ge—Urban Exploration in Georgia" website. In 1984, the Russian Soviet Federative Socialist Republic and the Georgian Soviet Socialist Republic (both part of the Soviet Union) began work on what would have been one of the most ambitious railway projects of the XXth century: a direct, 180-kilometre railway link between Tbilisi in Georgia and Vladikavkaz in North Ossetia via a 24-kilometre-long tunnel under the main ridge of the Greater Caucasus Mountains. 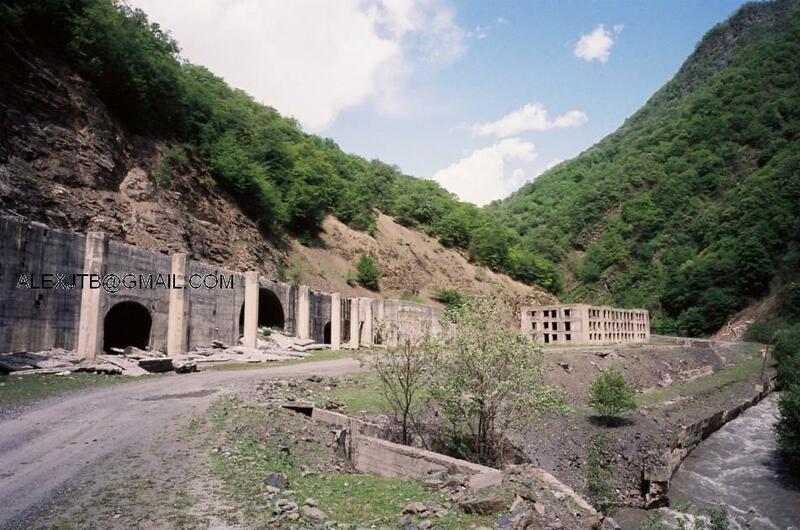 The line would have run north from Tbilisi up the Aragvi river, past the Jinvali reservoir and up through Khevsureti to a point a few kilometres north of Barisakho, where it would have entered the tunnel before emerging in Arkhoti, north of the watershed. 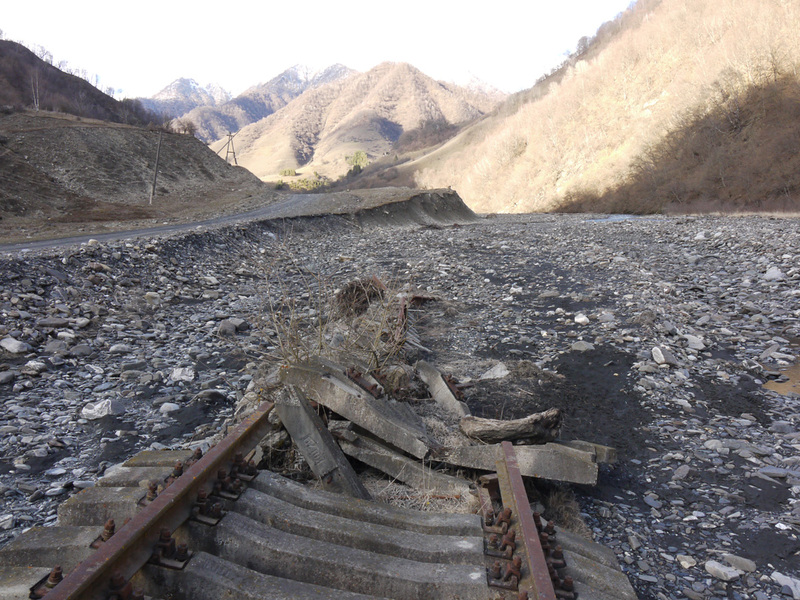 From there the line would have continued down the Asty valley in Ingushetia to Vladikavkaz, barely 50 kilometres away. The terrain through which the line would have to pass, however, was rugged and complex: 22 tunnels would have to be built along a 50-kilometre stretch as well as 70 bridges and 26 access roads, and countless galleries would have to be hewn out of the mountainside for both road and rail to pass where the valleys were too narrow. 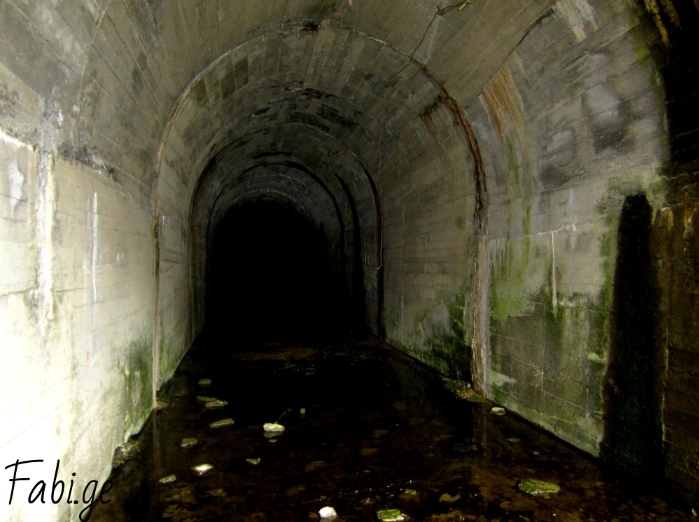 The main tunnel under the Greater Caucasus ridge, linking the regions of Khevsureti to the south and Arkhoti to the north, was expected to be 23.3 kilometres long; it was actually to consist of three tunnels running parallel to each other—one dual-track tunnel for trains, flanked by two single tunnels for ventilation and maintenance. Preparatory work on the tunnels began in 1985-86. The Aragvi River, where it ran close to the future tunnel entrances, was coaxed into another riverbed with the help of berms in order to make space for four building sites. 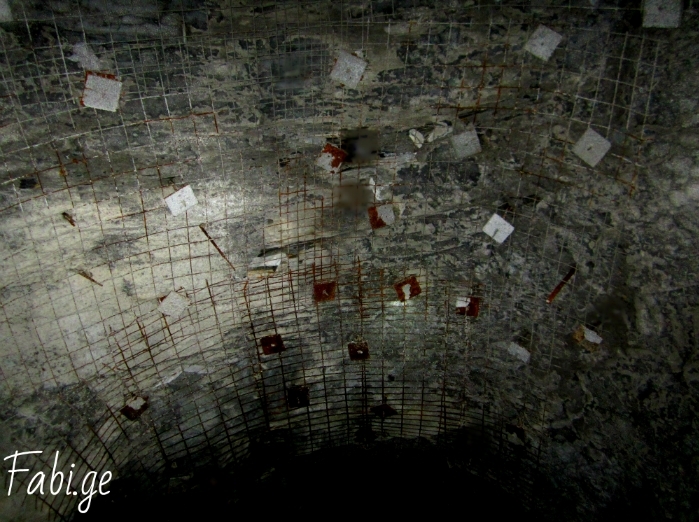 In 1987, following much preparatory work, workmen began to dig the main tunnel, but building came to a halt the following year as a result of the growing economic and political crises which shook the USSR. By the time the project was abandoned, the main tunnel was 20 metres long and the ancillary tunnels around 60-70 (respectively 0.08% and 0.28% of total planned length). An administrative building still stands by the tunnel entrances. Much to my surprise, the railway line is shown as being "under construction" in my copy (IXth edition, 2004) of the Times Atlas of the World! Mirian Khutsishvili, a remarkable documentary film-maker who (still!—he is 80 years old) works for the National Museum of Georgia in Tbilisi, was commissioned to make a film of the region before and during construction works. The film, shot between 1985 and 1991, is held in the Museum's ethnographic collections (along with hundreds of other ethnographic films, all filmed by Mirian—please see this page for a catalogue of his films).